You don’t come to Death Valley for the fast Internet. Or for good cell phone coverage. This is part of what makes it a rare and peaceful place, because once you arrive there is a moratorium on ringing phones, text messages, social media, and other such distractions. I’m a big believer in vacations. It’s hard to vacation when email is beckoning and the obligations of work can follow you every step of the way, so I think big western parks like Death Valley should stay “quiet zones” forever—but I’m sure that’s not going to be the case. Already in most of the remote places of the west there’s some spots of cellular service and so the responsibility is on me to put the phone and laptop away to disconnect for a few days. That takes self-discipline. To a self-employed person, it feels like shirking. Being cut off from the Internet is like going without water; you can only do it for a limited time, and gradually things begin to stink. The longer you ignore email and let the voicemails pile up, the more you know you’ll have to deal with later. 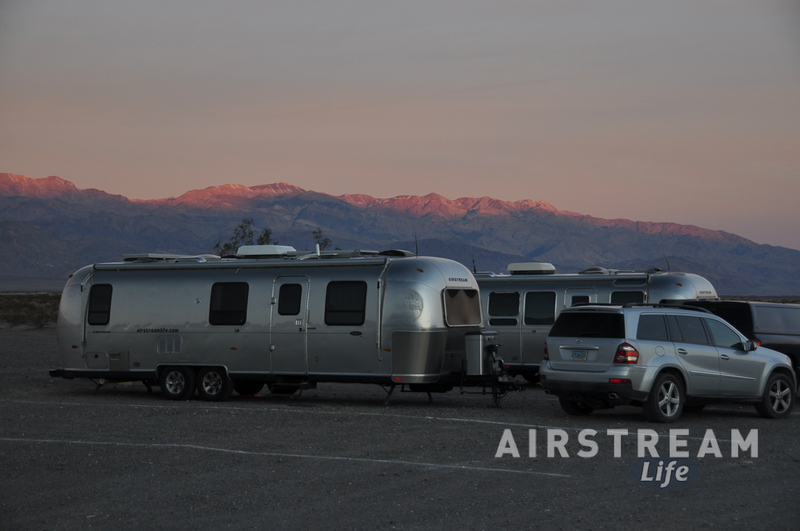 I have many friends who work and live full-time in Airstreams, and those people plan ahead carefully to ensure they can get online as they travel. 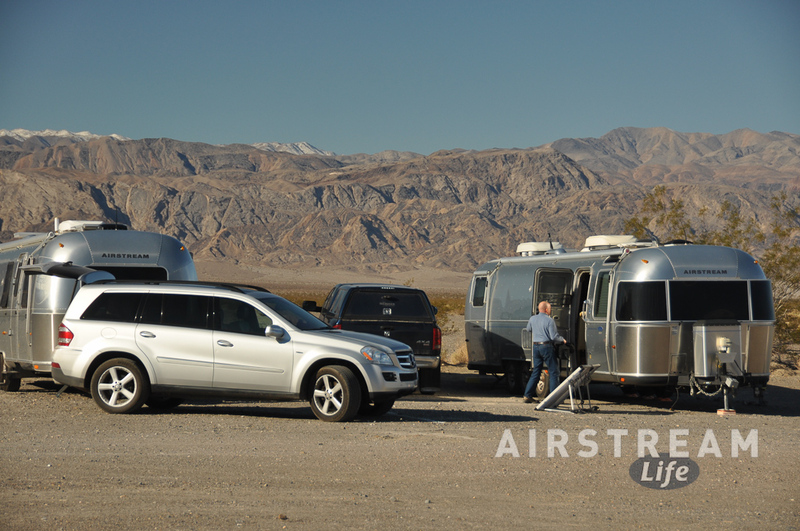 My friend Kyle is one of those people, so for him to tow his Airstream Classic 34 out to the “quiet zone” of Death Valley required getting ahead on work the week before in Pahrump NV, and then formally taking vacation time for the four days we would be camped at Stovepipe Wells in the vast desert. You also don’t come to Death Valley for the high-concept entertainment. There is little shopping, and no commercial attractions except the lowest elevation golf course in the world. It is a huge, mostly empty place with subtle pleasures: eerie landscapes, tiny animal tracks in the sand dunes, a fragment of human history, abandoned mines and ghost towns, strange salt formations, superlative altitudes (282 feet below sea level and 11,000 feet above), and of course legendary heat in the summer. Perhaps this is why there was hardly anyone there in January. You’d think the place would be flooded with visitors from northern states, escaping the gloom and snow for a patch of inexpensive desert sun, but the Stovepipe Wells campground was 90% empty, and we encountered few people during our explorations (except near Furnace Creek, by the Visitor Center and “ranch”). We have visited Death Valley I think four times over the past decade, and each time we find something different. It’s too big to see in a single visit, even if you stay a week. Driving from Scotty’s Castle or Ubehebe Crater south to the Devil’s Golf Course (for example) is about 70 miles one way. 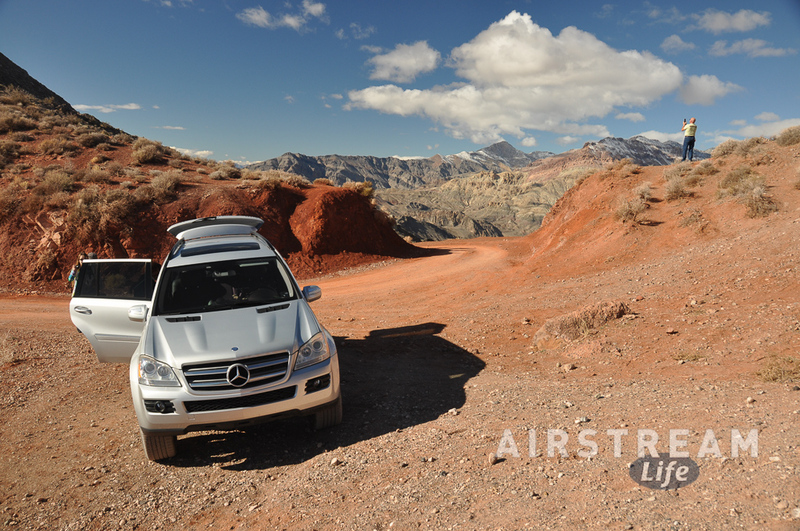 It’s easy to do 150 miles a day roaming from one interesting spot to another, and then back to your campsite. Normally we pick Furnace Creek as our campsite because it’s fairly central. This time we chose Stovepipe Wells just because it seemed like we might do more stuff in the northern part of the park. 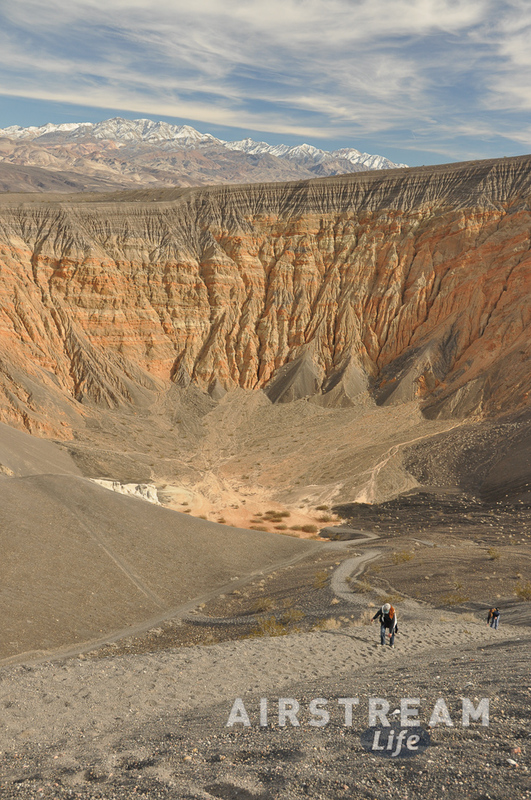 Scotty’s Castle (a popular historic house) was closed due to flooding, but that still left Ubehebe Crater (pictured at left), the Sand Dunes, Rhyolite ghost town, Leadfield ghost town, and the epic one-way Titus Canyon drive. Titus Canyon was the big goal for me this time. Eleanor and I first visited Death Valley in the early 1990s, camping in a tiny “2 man” tent and driving a rental car, and when I spotted Titus Canyon I was desperate to drive it. There are only two ways to experience Titus Canyon: by driving the entire road from Rhyolite (about 3-4 hours) or by walking uphill from the parking lot. Alas, we didn’t have time to drive it, so we walked a bit of the lower canyon and put it on the “someday” list, where it remained for over twenty years. This visit I was determined to make the trip. 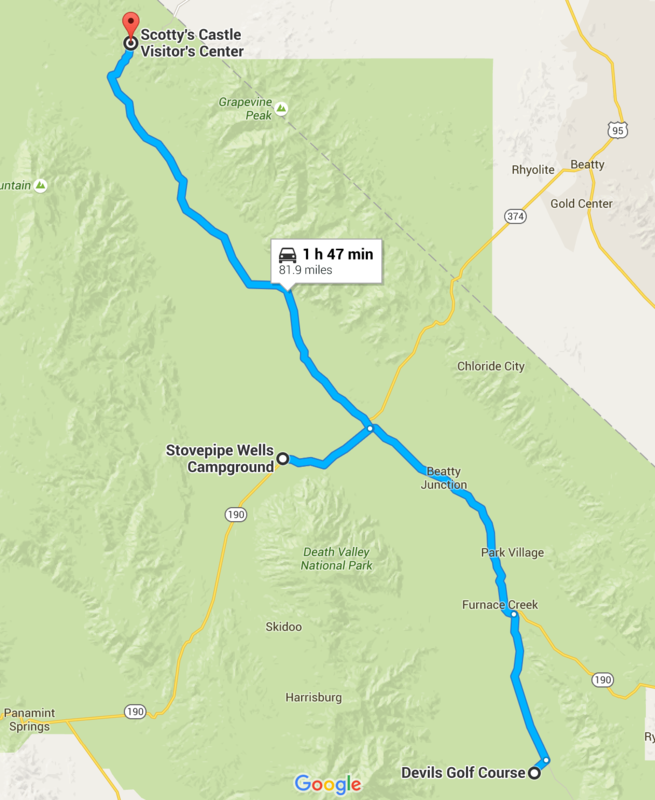 Since it’s a one-way road, you have to first exit the national park by driving to Nevada. This adds a “might as well” stop to the trip: Rhyolite ghost town in Nevada. There are a few buildings still there, and the most notable are the former train station (which no longer has tracks to it) and the Tom Kelly House (composed mostly of glass bottles). After a visit to Rhyolite (a quick one since it was rather cold due to higher elevation), we embarked on the Titus Canyon drive. 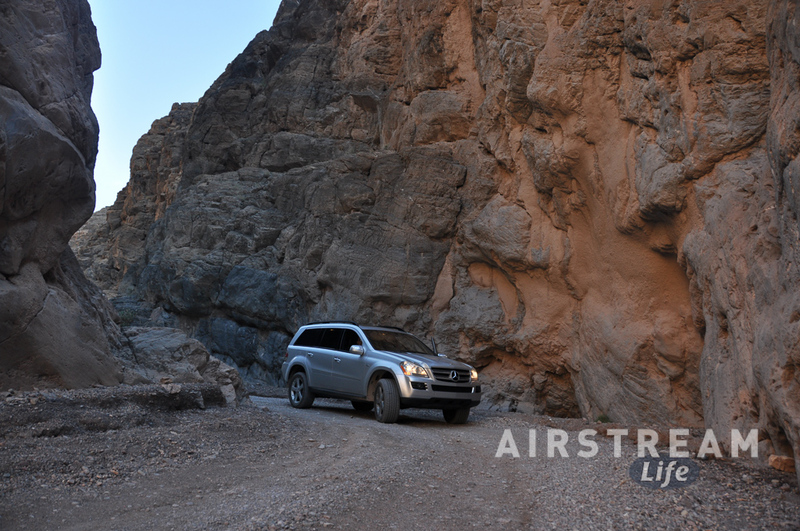 This drive is best with a high clearance vehicle and you’d better be OK with bumps because the first few miles are a tedious flat slog through the desert on a rocky road. After that it gets scenic—really scenic. It was worth the wait. Every twist of the road (and there are many of them) revealed a new vista. We lunched at Red Pass, a spectacular spot high in the mountains, and then slowly worked down to the abandoned mining outpost of Leadfield. Eventually the road enters narrow Titus Canyon for a couple of miles, which is very cool, and finally pops out into the wide open Death Valley to a small dirt parking lot. There we found a few envious visitors who were staring at the sign that says “one way traffic only”. So that’s the sort of thing you go to Death Valley for. Oh, and one other thing … the sunsets.